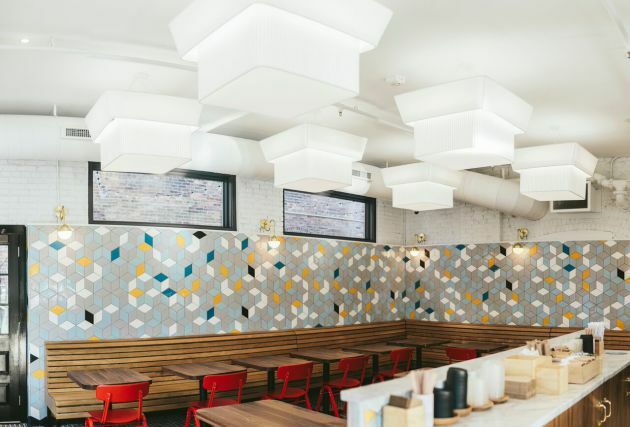 Another reason to visit Minneapolis’ North Loop neighborhood is materializing this Sunday, when the Bachelor Farmer cuts the ribbon on its daytime cafe. Housed in the former home of Askov Finlayson (the men’s fashion store moved to larger digs next door in August), the 40-seat, counter-service cafe will serve coffee and pastries in the morning and afternoon, and lunch daily. Owner Eric Dayton and his crew offered a bursting-with-pride sneak peek on Wednesday afternoon. Here's a preview of the conversation. Q: Does this place have a name? I see four icons — an x, a circle, a heart and a coffee mug — but no name. The main reason I didn’t want to give it its own name and brand is that I didn’t want to run any more Twitter accounts and Facebook pages. We’ve already got enough brands. We’ve got Marvel Bar [Dayton's lower-level cocktail bar], we’ve got the Bachelor Farmer, we’ve got Askov Finlayson. Capsule is this great design firm, and we asked them to give us a visual identity that isn’t a new name or a new brand. That’s where the four icons come from. We’re not trying to be Prince here, we’re not trying to be cute, we just didn’t want to have to develop a new brand. Someone might come in expecting a short-order version of the Bachelor Farmer, but that’s not what we’re set up to do. We don’t have a full range and a hood here, so we can’t do eggs to order, and things like that. That’s what Moose & Sadie’s does, they’re a great neighborhood institution right around the corner, and they already do all of that really well. We asked ourselves, what does the neighborhood already have, and what could we add that was complementary? We wanted to create a coffee shop with great baked goods, and a great sandwich shop. It’s really a daytime space where the Bachelor Farmer kitchen — and the Marvel Bar’s mentality, applied to coffee — can come together to offer something new to the neighborhood. Q: How long has the cafe been in the making? Eric Dayton: In a way, since 2012. That’s when we bought the building next door, but we didn’t take that project on right away. When we took over the renovation of that building, we decided to move Askov Finlayson over there. That presented an opportunity that we hadn’t really expected. A cafe seemed a natural extension of what we already had. It has been a good year-plus in the thinking, the designing and the construction. Q: What can you tell me about the lunch menu? Brett Weber, chef du cuisine at the Bachelor Farmer: We’ll have a lunch service starting at 11 a.m. Monday through Friday, and 10 a.m. Saturday and Sunday. It’ll run until 3 p.m. When I started thinking about the menu, I thought of all the things we already do really well at the Bachelor Farmer, and how we cook seasonally. The open sandwiches tend to be a little bit lighter, and the closed sandwiches — they’re like panini — are heavier, more substantial. You’ll be able to pair them with a salad or soup, offered in two sizes, half and full. We’re trying not to be your run-of-the-mill lettuce-tomato-onion sandwich. Instead, we’re challenging ourselves to stick with things that we’re really proud of, and bringing all of that into a cafe setting. The team works really hard on preserving vegetables during the spring, summer and fall, when they’re at their peak. I wanted to bring all of that into this menu as well, to create accents on the sandwiches. We want to continue celebrating the great things that are around in the summer that we can still eat in the wintertime. I’m pretty excited about that. Q: How about a for-instance, or two? Brett Weber: Our version of ham and cheese is house-made ham, with Camembert from Mankato, and some pickled zucchini from the summertime. Duck confit with caramelized cabbage and pickled sweet peppers from a farm outside Rochester; they were pickled probably in September. With the closed sandwiches, there’s braised beef brisket that’s shaved thin, with blue cheese, a little bit of horseradish and preserved green onions from the summer. And Ian [Heieie, the cafe’s sous chef] worked really hard on the little nuances that go into a grilled cheese sandwich. We settled on aged Comté and a little bit of Parmesan, with some caramelized onions and oyster mushroom butter. The closed sandwiches are all on house-baked pan di mie, an enriched white bread, and the open sandwiches are on a house-baked whole wheat bread. (PIctured, above, left to right: gravlax with pickled root vegetables; ham and Camembert with preserved zucchini; and duck confit with roasted cabbage and pickled sweet peppers). 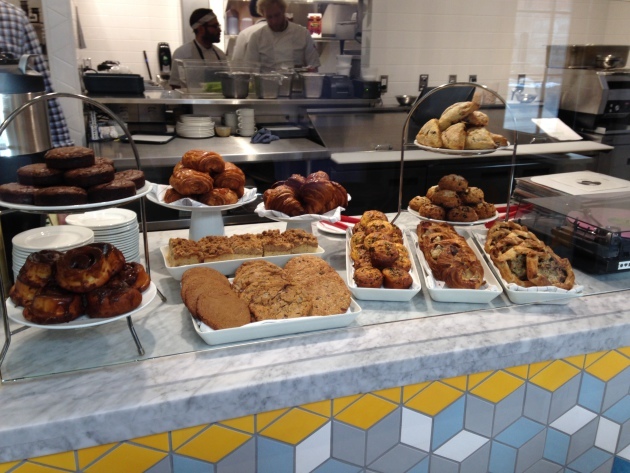 Q: Nothing says “good morning” quite like beautiful baked goods, right? Emily Marks, pastry chef: Our pastry program is an extension of the former brunch pastry program. We expanded our kitchen space, and with that additional space we can now do laminated pastries, which means we have croissants. Because we’re not serving a full breakfast, we did a lot of savory pastries, to give options for people who don’t like to eat sweet things in the morning. There’s a roasted vegetable galette — the vegetables will change seasonally, as more become available — a ham-and-cheese croissant and a creamy cheese-filled corn muffin. There’s a schedule of scones that will change daily. The cookies and brownies will come out closer to lunch, and on weekends we’ll have Bostok and Semla, two favorites from the former brunch pastry cart. Q: The croissants are knockouts. What kind of butter are you using? Emily Marks: I always have a hard time pronouncing it, it’s Wüthrich, a Wisconsin-made high-fat European cultured butter. I went and tasted a bunch of butters at Great Ciao, to kind of see what our options are, and it’s a really nice, flexible butter to work with. We also use Hope butter in our baking, but with laminated doughs, it’s high-fat butter, all the way. I missed making laminated dough, it’s one of my favorite things to do, I used to do it when I worked at Rustica; I was there for two years. It’s nice to be doing that again. Q: Eric mentioned that you have a new, second-floor kitchen. What’s it like? Emily Marks: It’s beautiful, and it’s great to work in a brand-new space that I got to organize. It’s bright, there are no window coverings right now, so the early morning sun comes streaming through. We overlook the river, it’s really nice. When I was baking at Cossetta -- I helped open the pasticceria there -- I was in the basement and I never saw daylight, so this is great. Q: What are some details regarding the coffee program? Casey Underkofler, head barista: We’ve partnered with Dogwood since the Bachelor Farmer opened, and the logical next step was that they developed a custom blend for us [called, not surpisingly, North Loop Blend]. Other than Dogwood, we’ll also be rotating offerings, switching with some of the best roasters from around the country, trying to bring in roasters that don’t already have a presence in Minneapolis. The first rotating offering is from Heart Coffee Roasters [in Portland, Ore.]. It’s super-exciting to get them in. As far as espresso drinks, we’re sticking with the classics. It’s in the same vein as the Marvel Bar, we’ll be executing the classics as well as we can. We’ll also have seasonally rotating specialty beverages, which will give us the freedom to play with seasonal, of-the-moment ingredients. Q: Who is behind the cafe’s design? Eric Dayton: We worked with James Dayton Design, they’ve done everything we’ve done here. It’s the most nervous that I’ve been about a project — the floor plus the walls — and I kept wondering if we’ve gone too far. I was like, ‘people are going to be dizzy.’ But once the wood and furniture started coming in, it all fell into place. [the tile was produced in Minneapolis by Mercury Mosaics]. 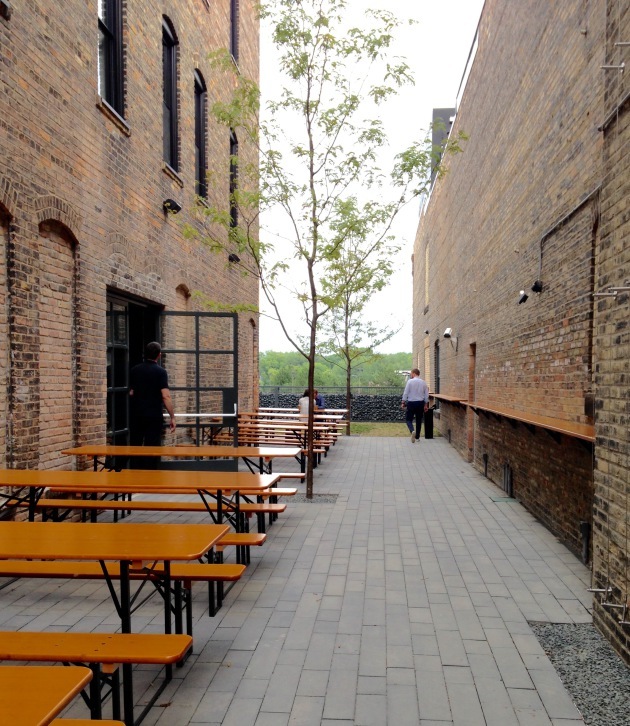 Q: What are you plans for the alley between the restaurant and Askov Finlayson? Eric Dayton: That property came with the building next door, it’s the first time we’ve had an outdoor space. We have this idea of a little pocket park, a little green space, which is something that isn’t exactly in abundant supply in this neighborhood. So we put in trees, and it will become an outdoor cafe as soon as the weather allows. A little down the road — probably late spring or early summer — the final phase of the plan is the idea of taking an old Airstream trailer and retrofitting it into what is essentially a food truck. We’re thinking that we’ll plop it at the very back of the alley, and when this closes at five, the hatch on the Airstream would pop open, and the outdoor space would go from cafe seating to a kind of little evening beer garden. Q: When can the public get inside? Eric Dayton: Sunday is the grand opening, and then we’re off to the races. I’m selfishly excited to have my breakfast and lunch spot right next to my office. The cafe at the Bachelor Farmer, 200 N. 1st St., Mpls., 612-206-3920. Open 6 a.m. to 5 p.m. Monday through Friday, 8 a.m. to 5 p.m. Saturday and Sunday. Lunch served 11 a.m. to 3 p.m. daily. Open sandwiches $6-$8, closed sandwiches $9-$12, salads $4-$9, soups $4-$8. Small wine/beer (six selections) roster, $5-$13.